Mouse brain tissue lysate and mouse brain tissue. Our Abpromise guarantee covers the use of ab176117 in the following tested applications. 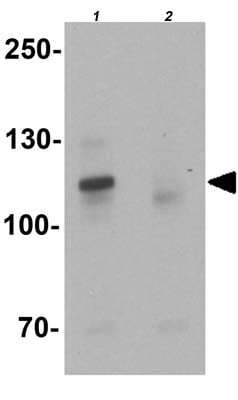 WB Use a concentration of 1 - 2 µg/ml. Predicted molecular weight: 119 kDa. 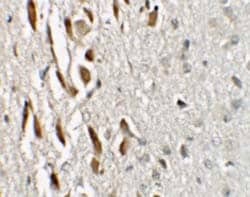 Immunohistochemical analysis of mouse brain tissue labeling ZNF537 with ab176117 at 2.5 μg/ml. Publishing research using ab176117? Please let us know so that we can cite the reference in this datasheet. There are currently no Customer reviews or Questions for ab176117.